Working closely with communities in Ghana, Indonesia, and India has given us firsthand, sobering insight into the problems affecting the 783 million people in the world without safe water and 2.5 billion without sanitation. Undeniably, the lack of safe and reliable water and sanitation services in low- and lower-middle-income countries impacts women, poor people, and other marginalized groups the hardest. 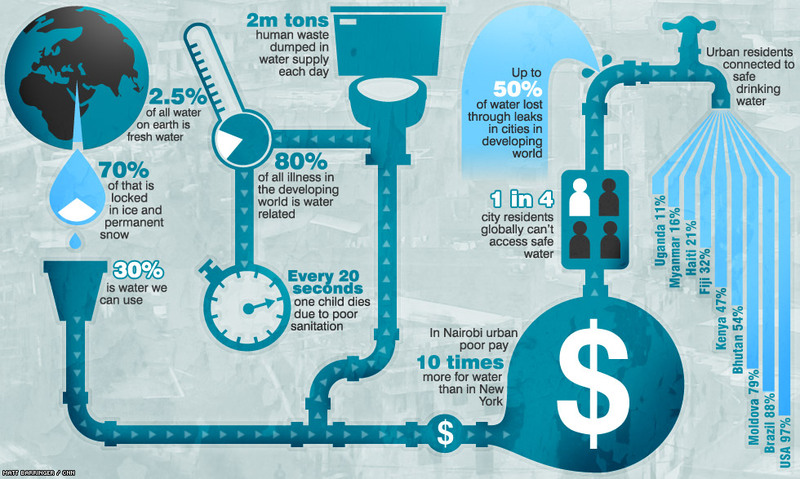 They spend disproportionate amounts of time and money and risk health and safety for basic needs—a glass of water or use of a toilet—for which other people within the same borders yet of different socio-economic statuses and means don’t have to give a second thought (see infographic below). Research has shown that a major factor contributing to this disparity is that poor and marginalized people often lack knowledge and access to information (Schilderman/DFID 2002). Research also indicates that when citizens and residents have access to better information, government is more responsive to their needs (Strömberg & Snyder 2010; Ferraz & Finan 2008). Citizens and residents are at a disadvantage when they do not know about their rights; available resources for getting access to basic services; infrastructure plans for their village, neighborhood, or city; or organizations that could help provide support and options for tackling problems. When governments don’t or can’t provide the information the poor need, non-governmental and civil society organizations attempt to fill the gaps, but can’t always meet the demand. Citizens and residents then turn to their communities to develop solutions on their own, which is also often inadequate to address the root of the problem. This lack of knowledge and access to information not only makes poor and marginalized people less able to overcome their current water and sanitation challenges, but it also increases their vulnerability to future hardship. The United Nations has recognized both the human right to information (Article 19 of the Universal Declaration of Human Rights) and the human right to water and sanitation (Resolution 64/292), but one greatly facilitates the other. Freedom of expression, transparency of information, and public participation lead to accountability and inclusive decision-making. Without these two things, governments and government agencies cannot successfully fulfill their obligations. Indeed, governments and organizations working on improving water and sanitation increasingly have been focusing on poverty, women, and marginalized groups, and recognizing the need to provide them with information and give them access to the decision-making process related to basic services. Governments are making moves to specify the need for freedom of information, transparency, and public participation in their water policies, or to include utility providers broadly in their freedom of information policies. For example, Indonesia’s National Water Policy (Kebijakan Nasional Pembangunan Air Minum 2003) outlines the need for a focus on the demands of the poor and marginalized groups, active participation of women in decision-making, fostering of transparency and openness, and facilitation by the government to provide advisory services. Further, their Law on the Openness of Public Information (Undang-Undang Keterbukaan Informasi Publik No. 14 2008) covers regulators and state-owned regional water companies (although not their private partners). Trying to follow in the footsteps of Finland, legislators in the United Kingdom responded to debate over whether utility providers are subject to Environmental Information Regulations by proposing reforms in 2011 to make private businesses that provide public utilities also subject to the broader Freedom of Information Act 2000. 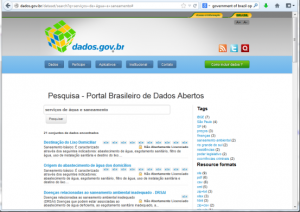 In 2012, the government of Brazil launched their Open Data portal in order to give the public access to raw data from public agencies. Governments, NGOs, and civil society organizations are also looking at different ways to meet the demand for access to information from and interaction with utility providers and other government agencies in a way that is both efficient and equitable (i.e., is accessible to everyone), which will greatly facilitate addressing urgent water and sanitation issues. Alvateli is a free software platform being utilized by governments in such places as New Zealand, Brazil, Kosovo, and Uruguay, which allows citizens to request information by email. The requests and replies are then recorded for all to see on a public website. Developed using highly inclusive and innovative participatory processes, the Open Data portal was launched by the government of Brazil in 2012 to give the public access to raw data from public agencies. The government of India’s Information Commission moved to completely digitize public information to make it easier to respond to a high volume of freedom of information requests. Clearly, progress is being made. The international community has recognized the human right to water and sanitation, and governments, NGOs, and civil society are recognizing the role that information and transparency plays in it. Access to information will enable women, poor, and marginalized people to engage more effectively as advocates for their own needs. Better information on the needs of poor and marginalized people will enable governments to be more responsive to real-life challenges, reform policy and governance for appropriate regulation and investments, and plan in the face of diminishing water supplies as a result of climate change, urbanization, and water pollution. Read about our WASH SMS project which is developing a platform that allows residents to send requests and inquiries via SMS (text message) to utilities, government agencies, and NGOS, then receive direct responses through their phone or a public website. open the scientific /engineering/ medical publication to the masses? , at least the most germane to addressing the post 2015 agenda? I use Google’s Scholar Alert to monitor for new publications dealing with sanitation, and global heath. With each email notification I get disappointment, finding that most relevant articles are behind walls I can not afford to climb. I live in Boston, Massachusetts and at $7 for a weeks use & $37 to purchase sight unread, I am locked out. Wanting to to skim 20 article a month over multiple walled($) sites while maybe adding 5 to a library for future reference, I am truly locked out. Taking this a step further, we can easily image what it means for small to medium efforts without deep pockets in countries with far less wealth! Somehow we must quickly come to a better model of sharing this knowledge as well. WASHLink, good point. This is a long discussed issue that has actually resulted in a boycott of at least one academic journal publisher. Pacific Institute, for one, makes most of its research available free and accessible online. And the WASH sector in particular has several efforts, though disparate, that aim to make research and knowledge more accessible. One of our projects (Community Choices) focuses on another aspect of this – making expert knowledge available and accessible to non-experts, particularly practical knowledge that can result in improved health and quality of life for those who are the furthest out of reach of useful research and tools. There is a surprising amount of resistance to this, even within the WASH sector. Hesperian’s seminal publication, “Where There Is No Doctor”, initially met with some resistance because many felt it was dangerous to enable those without professional medical training to diagnose and treat medical conditions. What became clear through the popularity of the guide and a key impetus for the Community Choices work, was the fact that many non-experts are often forced to make such decisions because neither professional assistance nor “doing nothing” are options. In such situations, all the better if they do have information available to support them.